The Ubaye Valley fancies itself as a cycling mecca, and while it’s not as dramatic and impressive as the Maurienne valley, it does have some great climbs. The best and most famous is the Col de la Bonette, which boasts of having the highest paved road in Europe (it doesn’t actually; see more here). One of the things the Ubaye Valley does to encourage cyclists to visit is provide a punchcard that allows you to track your ascent of seven cols (actually six cols and one climb, as the Col de Larche is closed to cyclists because of potential rockfall – although many people ride it anyway). 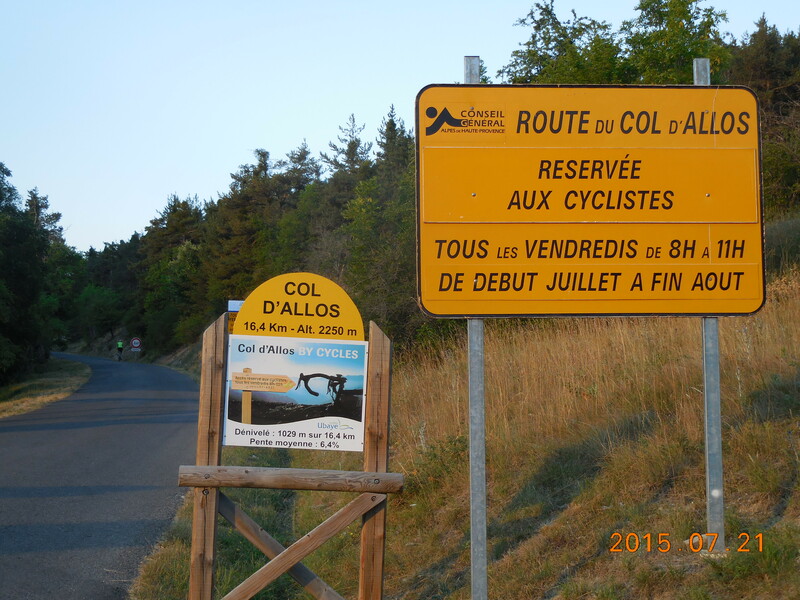 Also, every Friday from the beginning of July to the end of August, the Col d’Allos road is closed to cars between 9 am and 11 am. An amazing and beautiful climb. About 24 km with 1,580 meters (5,184′) of climbing from Jausiers (although I don’t think this elevation gain includes the steep climb up around the Cime de la Bonette, which you really should do.) At around KmM 13 you leave the valley and enter a world of huge bowls, then at KmM 14 a series of big switchbacks lead you up into a remote and wonderful world. Eventually the angle eases as you approach the Col, but you still have the bleak and steep circuit around the Cime. As 100GCC says, “There’s a word that’s used far too often today – one that’s attributed to just about anything cycling related – but in this book I’m going to use it just once, so here goes: the Cime de la Bonette is – EPIC.” A fantastic climb, the best in the area. A lovely climb, about 17 km long with 1,108 meters (3,635′) of climbing. As the road heads south it cuts across a cliff high above the valley floor. As 100GCC puts it, “Twisting upward, hugging the mountainside, teetering on the edge of oblivion, this tiny sliver of tarmac at times seems cut right out of the rock itself – round gullies, through knotted bends, it carves it path upward. Not for the faint-hearted, the road feels hidden and is very quiet; it has a primeval charm, like riding through a land that time has forgotten.” And then just before KmM 11.4 you round a bend and see a magical valley and mountain in front of you. One of my favorites. About 27 km and 1,184 meters (3,885′) of climbing. A rather tedious climb that initially parallels the Col d’Allos road southward but in the valley below, then heads east for a while then south. While it has its nice moments with good views, I found it far less interesting and enjoyable than most of the other climbs, as it mainly follows a rather uninteresting valley. About 7 km with 500 meters (1,640′) of climbing. A relatively uninteresting climb on a lovely road with a fairly uniform grade. 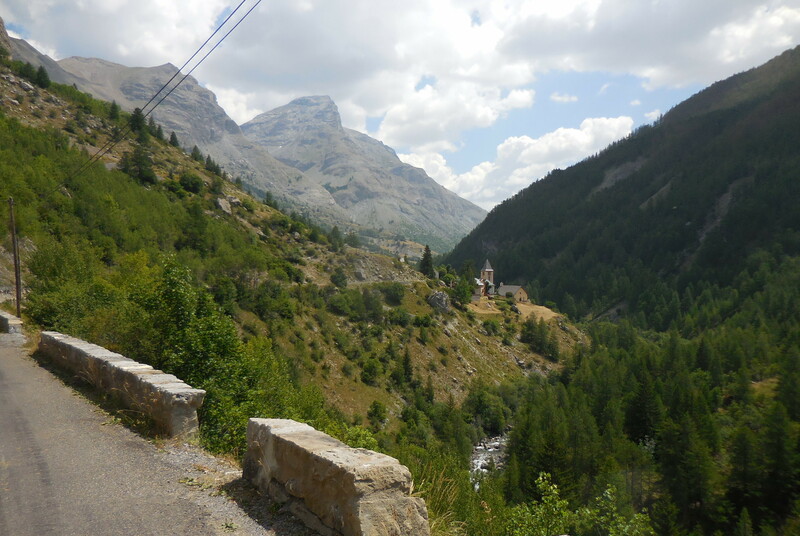 After leaving the Col d’Allos road it just goes for 6 km up to the ski area – the top is a one-way loop. On the way you pass Pra Loup 1500 where they are still celebrating Bernard Thevenet’s victory over Eddy Merckx 40 years later.